D.C. legal weed: Despite GOP efforts, Mayor Muriel Bowser presses forward with recreational marijuana law. 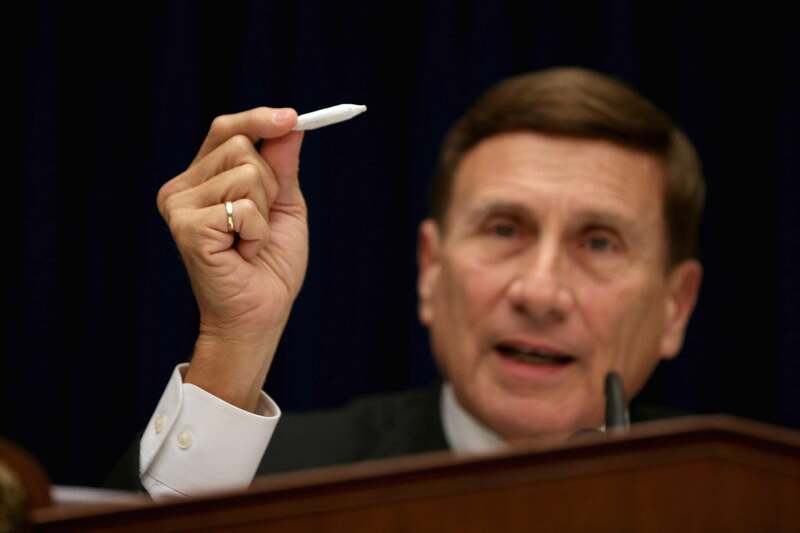 Rep. John Mica and his fellow House Republicans tried their best to stop D.C. from legalizing pot. Recreational weed is now legal in the nation’s capital—despite House Republicans’ best efforts to stop it. The new law officially went into effect at 12:01 a.m. Thursday. Congressional Republicans had hoped to block legalization, but despite their last-second threats, D.C. Mayor Muriel Bowser pressed forward with a law that district voters approved last fall by a margin of nearly 2-to-1. As the Associated Press reminds us, the nation’s capital is now the first place east of the Mississippi where recreational pot is legal. It is also legal to posses small quantities of pot in Alaska, Colorado, and Washington state. The D.C. law makes it legal to possess up to 2 ounces of marijuana for home use, and to grow up to three mature plants. But, unlike in Colorado and Washington, the sale of the drug remains illegal in the district. Congress has final say over D.C. laws, and late last year Republicans tried to thwart the pot initiative as part of the so-called CRomnibus bill they used to keep the federal government running. As I explained at the time, the attempted ban was inserted at the behest of a small band of anti-pot conservative hardliners led by Maryland Rep. Andy Harris, and ultimately neither the White House nor Democratic leaders were willing to make fighting it a priority. That rider was controversial and hypocritical—but in the end it appears to have been largely moot. The provision in question barred the city from using any funds to “enact any law, rule, or regulation to legalize or otherwise reduce penalties associated” with recreational use of drugs illegal under federal law. D.C. officials, however, say that was too little too late since district voters had already approved legalization the month before. On Tuesday, House Republicans attempted once again to pressure Bowser into backing down. “If you decide to move forward tomorrow with the legalization of marijuana in the District, you will be doing so in knowing and willful violation of the law,” wrote House Oversight Committee Chairman Jason Chaffetz and Rep. Mark Meadows, the North Carolina Republican who chairs the subcommittee that handles D.C. affairs. That threat, however, appears to be largely bluster. According to the Washington Post, House Republicans have made no plans to challenge the law in court. If the government wanted to go after Bowser directly, it would most likely do so under the Anti-Deficiency Act, which makes it illegal to spend federal dollars that haven’t been appropriated. That law has been used to dole out administrative punishment to government employees in the past, but no one has ever been convicted of violating it, according to the AP. The decision to prosecute also rests with the Justice Department, not House Republicans. Still, that doesn’t mean D.C. officials won’t eventually pay the price. Congressional Republicans could still retaliate by cutting funding for other programs in the capital. Meadows, for one, has already warned that it could become “very difficult for D.C.” to get the money it needs on other matters.